It is difficult to overstate the impact Beethoven had on Western classical music. His early compositions might be mistaken for those of Haydn, with whom he had studied, or of Mozart. From his earliest compositions, however, Beethoven’s own voice was starting to emerge, moving away from Classical constraints and ushering in Romanticism. He was also throwing off the shackles under which previous composers had labored. He would not be a servant like Bach or Haydn; he was declaring a new order. "The difference between Beethoven and all other musicians before him …. was that Beethoven looked upon himself as an artist, and he stood up for his rights as an artist. Where Mozart moved in the periphery of the aristocratic world, anxiously knocking but never really admitted, Beethoven … kicked open the doors, stormed in, and made himself at home" [Harold Schonberg]. The revolutionary from Bonn moved to Vienna, where he dominated the musical scene for nearly four decades, demanding—and getting—respect as an artist and changing the course of music history. Variations on “Ich bin der Schneider Kakadu” (“I am the Tailor Cockatoo”), Op. 121a (for violin, cello and piano): Beethoven’s compositions are traditionally divided into three stylistic periods. The “early” period is typically considered to last until around 1802, the “middle” period until 1812, and the late period until his death in 1827. The “Kakadu Variations,” believed to date from around 1803, were extensively reworked around 1816 and finally published in 1824, accounting for the higher opus number. 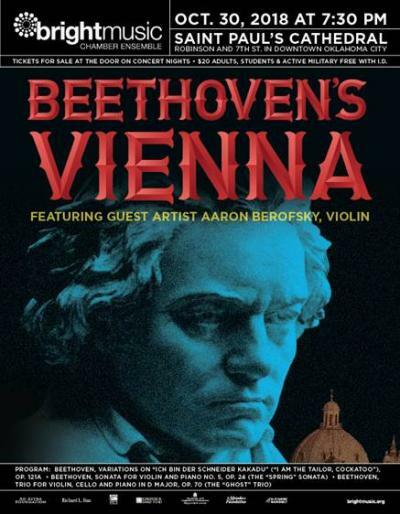 The central part is characteristic of Beethoven’s earlier style, but the depth and maturity of his later period can be heard in the introduction and the later variations. The theme, borrowed from a Wenzel Müller opera, was popular in Beethoven’s time. The work begins with a somber adagio that gives way to ten lighter variations. This work was the last of Beethoven’s trios to be published. Sonata for Violin and Piano No. 5 in F major, Op. 24 (the “Spring” Sonata): Beethoven wrote ten sonatas for violin and piano. His fifth sonata, a light and sunny work (thus the name “Spring”) was published in 1801, toward the end of his “early” period. A departure from his previous violin sonatas, it was written as Beethoven was breaking out of the classical mold of Haydn and Mozart, and transitioning into his “middle” period at the dawn of Romanticism. Beethoven kept many classical elements, but he expanded them and introduced new ideas. The F-major sonata is more symphonic in form, with the inclusion of a brief third movement — a playful, offbeat scherzo preceding the final movement. Beethoven did not bestow the nickname “Spring;” his official title was “Sonata for Piano and Violin,” as the piano and violin are treated as equal partners. This enchanting sonata is one of Beethoven’s most lyrical. Trio for Violin, Cello and Piano No. 5 in D major, Op. 70, No. 1 (the “Ghost” Trio): Well into his “middle” period by 1808, when the D major trio was written, along with the completion of his fifth and sixth symphonies, Beethoven’s deafness was advanced, and the first rehearsal in Beethoven’s apartment did not go well. The violinist Louis Spohr observed: "the piano was dreadfully out of tune, which did not trouble Beethoven in the least, since he could not hear it. Little or nothing remained of the brilliant technique which had been so much admired. In loud passages the poor deaf man hammered away at the notes crashing through whole groups of them so that without the score one lost all sense of the melody. I was deeply moved by the tragedy of it all. Beethoven’s almost continual melancholy was no longer a mystery to me." In spite of deafness, depression and ill health, Beethoven would soldier on, producing some of his most profound works, including the Ninth Symphony, the Missa Solemnis and the Late Quartets. The “Ghost” trio owes its nickname to Carl Czerny, who wrote that the slow movement reminded him of the scene in which the ghost appears in Hamlet. The lively first and third movements “sparkle with life” [Blair Johnston]. In stark contrast, the middle movement “is the slowest slow movement in all Beethoven. The weirdly-fragmented thematic material, unstable harmonies and sombre, quasi-orchestral textures, with eerie tremolos in the bowels of the keyboard, combine to produce music of extraordinary tension. . . . [Richard Wigmore]. The gloom is finally driven away in the trio’s third movement, the brilliant presto.